Summary: We keep our muscles strong and effective in the same way that we exercise our spiritual gifts and "prayer muscles" to keep them free from atrophy. Have you ever heard the term muscular atrophy? This is a wasting away of muscles which is a result of disuse or denervation (disrupted or cut nerve supply to the muscle). Disuse atrophy occurs because the number of nerve impulses to a certain muscle has been greatly reduced, as in the case of those who are bedridden or those with a cast. Individual muscle fibers begin to decrease in size because of progressive loss of myofibrils (contractile elements of skeletal muscle). 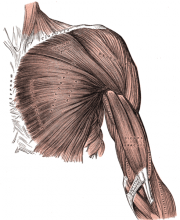 In about 6 months to 2 years, the muscle will be about one-quarter of it’s original size, and the muscle fibers will be replaced by fibrous connective tissue. Once the transition to connective tissue is complete, it cannot be reversed. The Bible tells us that after the creation of Adam, in his perfect state, “the LORD God took the man, and put him into the garden of Eden to dress it and to keep it” (Genesis 2:15). Though rich in all that the Owner of the universe could supply, they were not to be idle. Useful occupation was appointed them as a blessing, to strengthen the body, to expand the mind, and to develop the character (To Be Like Jesus, 254). If the muscles are allowed to remain unused, it will soon be apparent that the blood does not sufficiently nourish them. Instead of increasing in size and strength, they will lose their firmness and elasticity, and become soft and weak. Inactivity is not the law the Lord has established in the human body. The harmonious action of all the parts,—brain, bone, and muscle,—is necessary to the full and healthful development of the entire human organism (Fundamentals of Christian Education, 426). Our bodies contain nearly 700 individual voluntarily controlled muscles. Most of these muscles have important functions in producing movements of body parts. As we have seen, disuse of muscles over time will inevitably produce reduced mobility. But what is true in the physical world, also has a counterpart in the spiritual. Let a strong man be shut away from labor, and he becomes feeble. That church or those persons who shut themselves away from bearing burdens for others, who shut themselves up to themselves, will soon suffer spiritual feebleness. It is labor that keeps the strong man strong. And spiritual labor, toil, and burden-bearing, is what will give strength to the church of Christ (Testimonies for the Church Volume 2, 22). If we want to be strong in our walk with the Lord—if we want to be strong in our family, our church, and our community—we must exercise our spiritual muscles. As we enter the final moments of this earth’s history, we need to increase our spiritual exercise to strengthen ourselves for the battle that lies just ahead. We need to engage in the exercise of prayer—personal and intercessory. We need to exercise our benevolence for soon the time will come when it will be too late to invest in the cause of Christ. We need to exercise God-given gifts of hospitality, organization, music, and physical strength to help give the final message of mercy to this world. We are physical and spiritual beings, and both aspects need to be properly exercised in order to avoid atrophy. Read about Serving Others, one great way to strengthen your spiritual muscles. If you enjoyed this article, share it with a friend. To learn more, check out our media site—Amazing Discoveries™ TV.